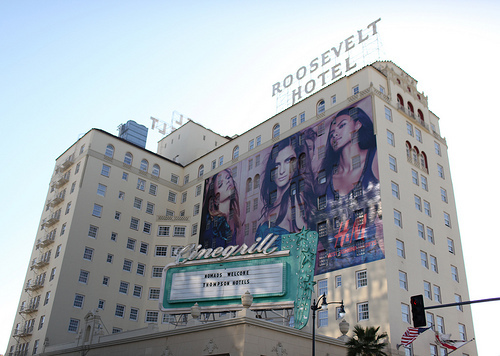 The battle between the city and the owners of the historically-registered Hollywood Roosevelt Hotel over the right to keep a supergraphic ad on the side of the building landed in federal court two months ago, with the hotel owner and sign company claiming that the city’s refusal to issue a permit for the sign is a violation of the 1st amendment right to free speech. In a counterclaim filed two weeks ago, the city asked the court to declare the sign a “public nuisance” and order it taken down. The city also is seeking a $2,500 per day penalty for every day the sign has been up, which the city claims to be at least eight months. The cumulative penalty to date would thus be more than $500,000. The Las Vegas-based sign company, In Plain Sight Media, features the hotel supergraphic in a slide show on its website. The hotel is owned by Thompson Hotels, a boutique hotel chain headquartered in New York City. The most recent supergraphic advertised H&M, a Swedish clothing company.